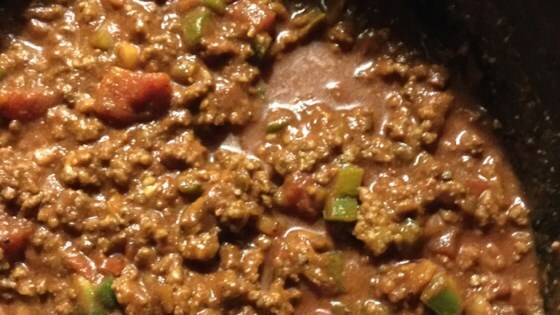 "If you like spicy food like me, you will enjoy this chili; it's not for the faint of heart." Stir tomato sauce, diced tomatoes, onion, jalapeno peppers, chili powder, cayenne, salt, garlic, and black pepper together in the crock of a slow cooker; add ground beef and stir. Cook on High for 6 1/2 hours (or on Low for 10 hours). If you don't like jalapenos, you could opt for 1 green bell pepper instead. If you like it hotter opt for habanero peppers. As with most chili, it would go great with shredded Cheddar cheese and bread. Really good; probably my go-to beanless chili. I followed the recipe but used one jalapeno and one green pepper. Made it 3 times in the past two months. It's a keeper for our family!